It has only been a decade since researchers successfully isolated graphene for the first time, but scientists are already developing increasingly sophisticated ways to make it. The latest effort comes out of MIT, where a team developed a way to work around one of the trickier aspects of graphene manufacturing. Graphene is generally made in a high-temperature oven, where it pulls out of the air and deposits on a sheet of metal like copper or nickel. A visual representation of how graphene is grown and then removed. Photo courtesy of MIT. 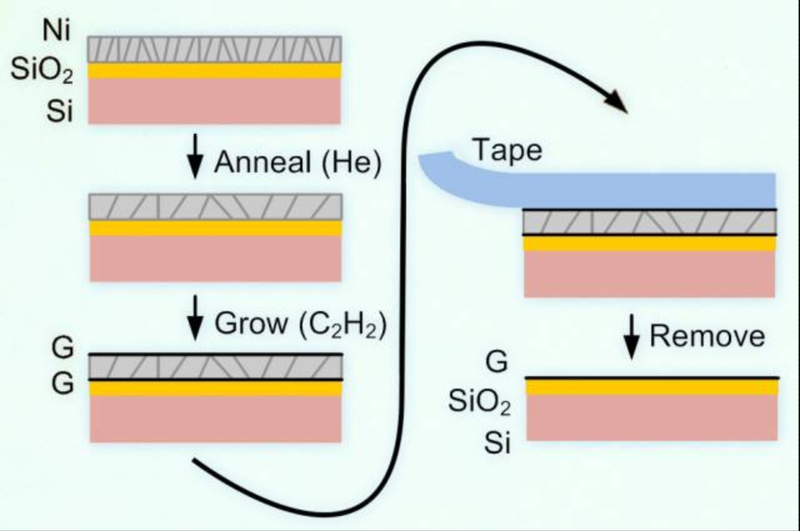 The team got around the need to transfer the graphene by making a sort of metal sandwich; instead of just growing the graphene on one side of a sheet of nickel, they grew it on both sides. The sandwich sat on a sheet of glass, so when the top layer of graphene and nickel were peeled away, it left a sheet of graphene on the glass. The combo is then ready to be integrated into a TV or mobile device screen. The process isn’t just limited to glass. Graphene could also be grown on a flexible material that works well in solar cells or directly on silicon wafers. “We’ve shown this mechanism can work. Now it’s a matter of improving the attributes needed to produce a high-performance graphene coating,” Hart added in the release. Yes, but didn’t they also discover recently that Graphene is extremely brittle when it has a small crack in it? (http://www.theepochtimes.com/n3/661306-scientists-find-fatal-flaw-in-brittle-graphene/) Does this new process perhaps greatly reduce the chances of that? …already have it..it’s called sapphire..ruby.. Hurry; the world needs the desalination process to be taken to the next level in an urgent way. Graphene can aid the process by increasing filtering efficiency, and reducing costs. Keep on working on it guys! You’ll get it!!! Can it make into a I-Beam ? Graphene is a very strong pure carbon that is an awesome conductor of heat and electricity. It be nice if they had mentioned what graphene is and why it’s important. Unlike soft and slippery graphite (a form of carbon) the hexagonal array of carbon atoms in graphene form a continuous sheet only one atom thick. It conducts electricity well and is super strong. More articles about it will appear as it becomes commercially available. Thanks for the update on graphene. I would be interested in any other developments in that area.